Been a while since I last posted so time for a update post! The network at the Zoo was a miserable mess - it took me a while to audit what was in place and to devise a topology that would best address the current and future needs of the Zoo. Now the Zoo has a VLAN'd network consisting of dedicated Administration, Point-of-Service and VoIP subnets, OSPF routing at the core, a DMZ, traffic policing and shaping capabilities and VPN (PPTP/L2TP and IPSec) capabilities. I achieved all this by using two rackmounted WRAP1-2's from Yawarra and a cheap Asus GigaX 2024 switch. I loaded Mikrotik RouterOS 2.9.42 onto the two WRAP1-2's and set up 802.1q VLANs on the switch. The VLANs are routed on the first WRAP1-2 which then connects onto the DMZ where the other WRAP1-2 and Cisco 857/877 routers exist with OSPF routing throughout. The second WRAP1-2 holds up the 1Mbit Unisky wireless connection (PPPoE, over wireless... yuk) and hopefully a substantial fibre based service from someone, such as a 2Mbit E1/G.703 service. I used pairs of Cisco 8xx series routers to hold up VPN links between the Zoo and its newly opened Mooloolaba retail store. A pair of 857's hold up a general Point-of-Service/LAN traffic IPSec tunnel. In addition to that a pair of 877's hold up a VoIP/Video IPSec tunnel with QoS. The two DSLs are 8Mbit/384Kbit links supplied by Bigpond. Having dedicated 'pairs' of routers/DSL for VPN connectivity is overkill but it's still cheaper than a single fibre service. These changes provided the framework for the following additions to the network infrastructure. The Zoo's old Siemens key system was well and truely past its time and was needing upgrades which proved to be exorbitantly costly to do. A new Alcatel OmniPCX PBX was selected and installed by company called Nexon Asia Pacific. Along with the digital and analog extensions a number of VoIP extensions are provided including wireless VoIP sets. Best practice says to establish a dedicated subnet for the PBX/VoIP services to reside within so as to isolate it from the general traffic of the other networks. Having VLAN capability is useful as I can locate the phones nearly anywhere and still keep them within the VoIP subnet. However while the phones support VLANs, they don't want to communicate with the Asus switch. First it was wireless and whales, now its wireless and... um... elephants? I will soon have a Zoo wide wireless network built up of Symbol WS5100 and AP300s. These were provided by Barcode Dynamics in addition to inventory/asset tracking equipment. The WS5100 is useful in that it can map VLANs to WLANs - allowing me to simply create wireless extensions of the existing networks with no physical modifications. However security becomes a concern with the absence of a router/firewall - the WS5100 addresses this by supporting WPA1/2, 802.1x and firewall policies. I will also limit transit between the networks and wireless infrastructure via the routers. To start with the wireless will be used for mobile VoIP. Since the Alcatel mobile sets are basically Spectralink reference designs I can simply apply the pre-configured Spectralink QoS policy on the WS5100 to that WLAN so that it grants expedited access to the wireless bandwidth to VoIP traffic. In the future we will also implement mobile Point-of-Service terminals, either PDA style units or small form factor PCs. There's also the possibility that the roaming photographers could also use the coverage to upload their digital photo's in real-time to the on-site photography lab. 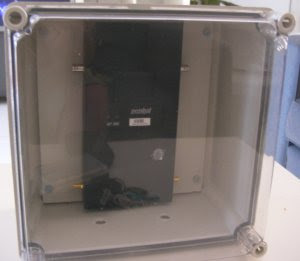 I've just finished setting up a outdoor enclosure for one of the AP300's. It's a pity that the AP300 doesn't have an outdoor variant. The supplied enclosures were just bare boxes, luckily they came with the backing board. 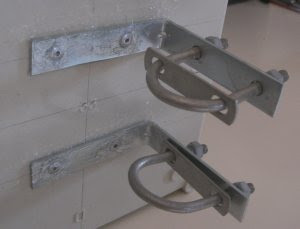 However I had to make up the pole brackets myself using some angle brackets, u-bolts and pop-rivets. For the newly launched Whale One vessel the Zoo has established a NextG mobile data service. To connect the boat to this service a ruggedised NextG modem/router was installed on the boat with a 7dBi collinear antenna. The router comes with a PPTP VPN client so I have set this to establish a VPN back to the Zoo. This allows the two Point-of-Service terminals to communicate back to the Zoo's POS services for EFT transactions and accounting/stock control. Under testing we managed to maintain a connection out to 10km to sea and sustain an average data rate of 1.5Mbit/sec. I have yet to test the link with the POS systems running.